Examine a curve defined parametrically. 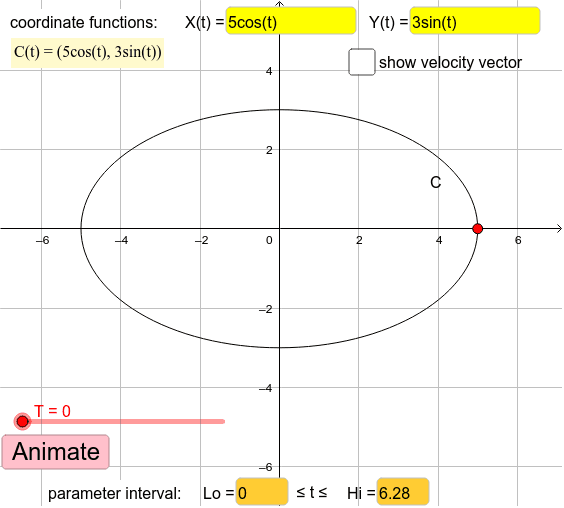 Enter coordinate functions for C(t) = ( X(t) , Y(t) ) at top of window [use variable t]. Enter ends of parameter interval [Lo,Hi] at bottom of window. A slider specifies number T for point C(T) to be marked on the curve; animation shows how that point moves as T increases from Lo to Hi. A checkbox gives an option for the velocity vector at C(T) to be displayed.